The best of 'The Big Easy' awaits at this vacation rental house! 'The Queen Magnolia,' is a 2-bedroom, 1-bathroom historic shotgun-style house with accommodations for up to 4. 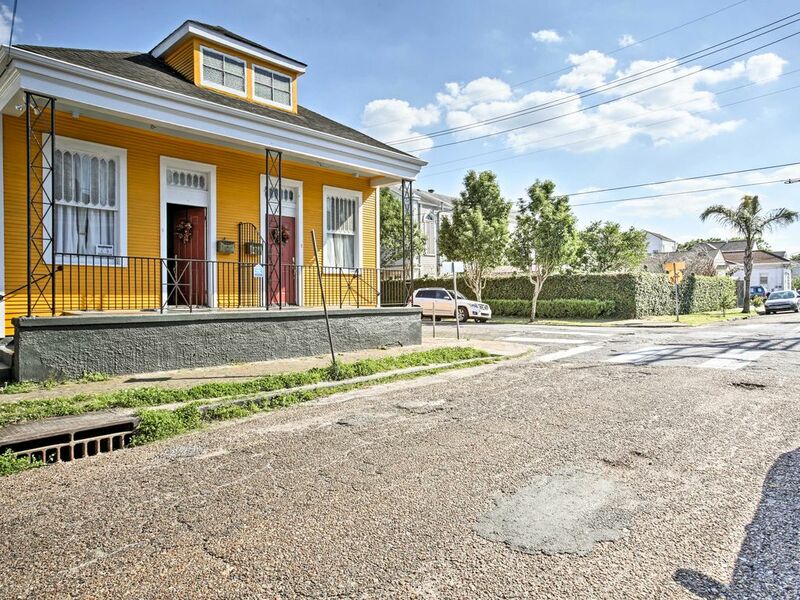 Situated in the historical Irish Channel area, this house is in the perfect location to see and do everything New Orleans has to offer before returning to enjoy a Sazerac on your private back patio. This recently updated home offers everything you need for a perfect vacation! Kick back on the large sofa in the living room and catch up on the morning news before you head out for the day. You'll love the original hardwood flooring from the 1930s as well as the 12-foot-high ceilings that create an open and airy feeling throughout the home. Your favorite place to spend your time will surely be out on the private patio! Pour yourself a cocktail and recap the day's activities with your travel companions. When you're not enjoying a crawfish dinner at one of the nearby restaurants, stay in and cook all of your favorite meals in the well-equipped kitchen. After a long day, draw yourself a bath in the clawfoot tub and feel all of your stress melt away. Use the wireless internet access after your soak to plan the next day's activities! You're sure to rest well at night after a day on Bourbon Street! The first bedroom has a queen bed, the second room has a set of twin beds, and the living room has a twin-sized pullout bed for an additional guest. This shotgun-style home is in one of the best locations in the city! Magazine Street, known for its restaurants, bars, and antique stores, is just 2 blocks away. You can rent a NOLA Blue Bike and ride to tons of destinations around the city. The Garden District and all of its mansions are only 3 blocks from 'The Queen Magnolia.' Be sure to book a walking tour to explore the area! Hop on the streetcar located on St. Charles Avenue and take it down to the Audubon Zoo. This 58-acre zoo is home to 2,000 animals and is a can't-miss attraction! More animal adventures await at the Aquarium of the Americas on Canal Street - just 10 minutes from the house. No trip to 'The Big Easy' would be complete without a stop by the French Quarter to party all night long on Bourbon Street. If you'd prefer to take it easy, stop by any of the district's restaurants for some traditional creole cuisine! - Amenities include a well-equipped kitchen, free WiFi, private back patio, flat-screen Smart TV, regular TV, complimentary toiletries, parking, and much more! - This home's central location and private backyard and patio make it a great for a small party! The house was just right for our trip! Plenty of room for a group that gets along and nice neighborhood for morning walks. Close to Magazine Street and walking distance to the historic garden district and Lafayette cemetery No. 1. Tenisha is a great host and was super helpful with ideas what to do! The house is in a safe neighborhood and just two blocks from magazine street. The house accommodated four of us well. The shower is a little tight, but got the job done. It was not super clean, but suited our needs. The house is ideal for those that are looking for something affordable and just somewhere to sleep while visiting an exciting city! Great location and Tanesha was super flexible and friendly (came out to meet us when she heard us leaving one night). It was quite hot in the house at times since there isn't central air, but the window air conditioners were great for sleeping, just be prepared for the front room, kitchen and bathroom to be fairly warm. I loved our stay and Tanesha was the best. Anything we needed, she was available. She informed us of events and places to go for great food. The location was clean and to everyone's liking. Will definitely be back to visit again. Amazing location and nice clean welcoming home with a great owner. Beautiful home in an incredible location a 2 min walk from many my favorite things in New Orleans. The owner was super accommodating and helped us repeatedly with small questions we had throughout our stay. Will definitely be coming back here again.